The founders, leaders, and team members at GuardOne Security share a commitment to securing our clients, communities, and one another. 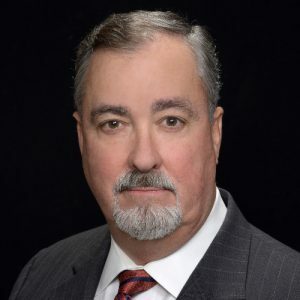 Robert F. Copeland, President and CEO of GuardOne Security, has been successfully leading, operating and growing security companies for nearly two decades. Since helping merge S&S Management Group with GuardOne Security in April 2015, Copeland has improved efficiency and grown GuardOne acquisitions and revenue. Before GuardOne, Copeland owned C H Security Services, in Atlanta, managing all aspects of the business that increased revenue 300% and enhanced customer relations. Copeland has also served as President and CEO of Global Chemical Solutions and Rite Industries. Copeland held Executive and Board level positions at Sybron Chemicals with responsibility for $70 million in global sales in North and South America and the Far East. While managing Sybron’s Tanatex division, Copeland helped establish manufacturing and sales operations in Canada and Mexico and grew global sales and earnings 10% per year. Copeland’s background also includes 11 years of sales within the chemical industry throughout the Southeast and Pennsylvania. Copeland earned an MBA from the University of North Carolina at Charlotte and a BS degree in Science from North Carolina State. He lives in Atlanta with his wife, two children, and three grandchildren. He’s an avid golfer and published novelist.